Laslo Djere entered the Rio Open as an unheralded 23-year-old from Serbia. He left with his first ATP Tour title -- and his victory speech likely had many looking for tissues. "I want to dedicate this trophy to my parents," Djere said in front of the Rio crowd after defeating 18-year-old Felix Auger-Aliassime of Canada 6-3, 7-5 in the final. "I lost my mom seven years ago, so I want to dedicate this one to her." Djere received rousing applause, but he wasn't done with his touching tribute. "And also to my dad," Djere continued. "I lost him two months ago. My parents had the biggest impact of me, and because of them I am who I am today. ... I hope they're watching me now. "I'm really thankful for my younger sister," Djere added. "She's back home in Serbia. She's been a big support for me, and I'm really thankful that I have her, and also to my girlfriend. She's been with me in my toughest moments, so I can't be thankful enough for them." Djere's win caps a crazy week in Rio, with seven out of eight seeds losing in the first round in the ATP 500 event. One of those upsets was top seed and 2017 champion Dominic Thiem of Austria, whom Djere defeated 6-3, 6-3. It was Djere's first win against someone ranked in the top 10. Djere then went on to defeat Japan's Taro Daniel and Casper Ruud of Norway. He was set to face Slovenia's Aljaz Bedene in the semifinals but advanced to the final on a walkover. That left him fresh for his match against Auger-Aliassime. It was the first final for both players, and Djere broke the Canadian six times en route to victory. 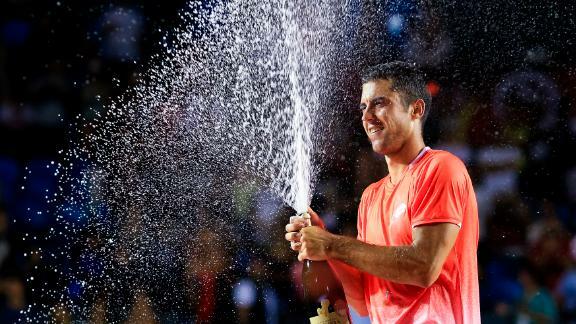 Djere, who was ranked 90th in the ATP rankings at the start of the tournament, rose to a career-best No. 37 on Monday following the win. He receives 500 ATP Rankings points and $369,000 in prize money. "I don't know many tennis players who went through these things," Djere said, according to the ATP website. "I want to be that guy who inspires others and shows that you can still be successful. "It's been the week of my dreams. So many things have been achieved here. I'm really happy, excited and emotional now. I'm happy I could push through this match because it was very tough mentally and physically."